15-year-old Khushi, lives with her parents, older sister and younger brother. Her mother works as a domestic help. Her father works as a daily wage labourer at a construction site. Khushi and her older sister regularly attend the adolescent monthly meetings organised by SNEHA’ EHSAS team and was part of the anaemia screening camp. Khushi was found to be severely anaemic with a haemoglobin level of 6.4 grams/ml instead of the required 12 grams/ml. The Community Organiser made several visits to her home to convince her mother about the seriousness of low blood count and the treatment required. Initially, her mother refused to take her to the hospital because she didn’t have the time or energy to coax her daughter or keep tabs on her medicine intake. The Community Organiser was however persistent and kept visiting the house every two days with flipcharts and other educational tools to explain the symptoms, causes and the severity of the situation. The mother finally agreed to get the necessary treatment for her daughter. The Community Organiser accompanied Kushi and her mother for the initial health check-ups and followed up regularly on her intake of food and medicine. When Khushi attended the post-test screening, the Community Organiser said, “She was looking better than before”. The efforts showed in the increase in the haemoglobin level from 6.4 grams/ml to 10 grams/ml. Khushi promised to continue the treatment. On 31st May 2018, post-test screening was conducted in Antkoneshwar Maidan, Bhaskar Nagar, Kalwa East. A total of 61 girls were screened out of which 26 girls showed mild anemia, 32 moderate and two had normal haemoglobin levels. In our efforts to strengthen the communities’ access to health and generate awareness in the Kalwa area of the Thane District, the EHSAS (Empowerment, Health and Sexuality of Adolescents) team at SNEHA conducted anemia screening for adolescent girls in the area. 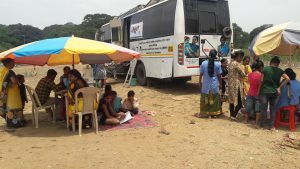 The team’s efforts began last year, when 151 girls were screened between 22nd and 28th September 2017, with support from the SNEHA-SIEMEN’s Sanjeevan mobile van. The screening indicated that 28 girls were in the mild category, 114 girls in the moderate category and six were detected with severe anemia. These six girls were referred to the Chatrapati Shivaji Maharaj Hospital in Kalwa. “I’m usually scared of injections, but the SNEHA Community Organiser made me understand that I need to test my blood to know how healthy I am,’ said a participant during the anemia pre-test screening process. After the pre-test screening, the first step was to educate parents and young girls about the symptoms, causes and treatment of anemia. This was done through several meetings, one-on-one interactions, sessions and film screening in the area. IFA (Iron & Folic Acid) tablets were distributed to girls in the mild and moderate category. The girls and their parents were informed about the side effects of taking the tablets. These side effects are not serious or harmful, and subside in a few days. However, parents and girls still get worried when the girls face discomfort (Stomach ache, diarrhoea, constipation) or black stools. The challenge for the team was to then convince them to continue with the prescribed treatment to increase their haemoglobin level and not get too troubled by the side effects. On 31st May 2018, post-test screening was conducted in Antkoneshwar Maidan, Bhaskar Nagar, Kalwa East. Girls who were not a part of the pre-test screening camp were eager to be a part of the post-screening camp. A total of 61 girls were screened out of which 26 girls showed mild anemia, 32 moderate and two had normal haemoglobin levels. One of the girls who was found with severe anemia was referred to the Chhatrapati Shivaji Maharaj Hospital, Kalwa. “Now I make sure that my daughter eats home-made food. She gets very hungry,’ said the mother of an adolescent girl who underwent treatment for anaemia.